Review: For their latest trip into house history, reissue specialists Mint Condition takes us back to 1996 and the TB-303 heavy world of Chicago legend Armando Gallop. "The Future" was originally included on the artist's One World One Future full-length, before going on to become his final single release before he passed away in December '96. 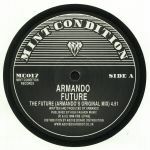 As with many of his finest works, "The Future" is a ragged, acid-fuelled delight, with warehouse-friendly stabs and repeated vocal samples riding a sweaty, jacking groove. Turn to the flip for Luke Solomon's subtle re-edit of Cajmere's "Vision" rework, a lolloping and groovy affair that trims the acid lines in favour of denser bass, spacey chords and a superb vocal line ("I see the future", presumably sung by the remixer himself).